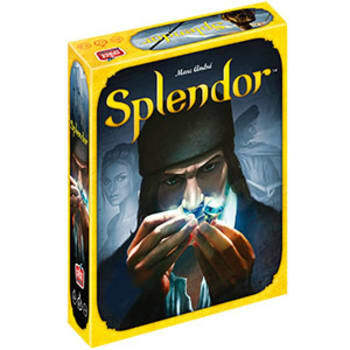 Splendor is a fast-paced and addictive game of chip-collecting and card development. Players are merchants of the Renaissance trying to buy gem mines, means of transportation, shops; all in order to acquire the most prestige points. If you're wealthy enough, you might even receive a visit from a noble at some point, which of course will further increase your prestige. On your turn, you may (1) collect chips (gems), or (2) buy and build a card, or (3) reserve one card. If you collect chips, you take either three different kinds of chips or two chips of the same kind. If you buy a card, you pay its price in chips and add it to your playing area. To reserve a card, you place it in front of you face down for later building; this costs you a round, but you also get gold in the form of a joker chip, which you can use as any gem.